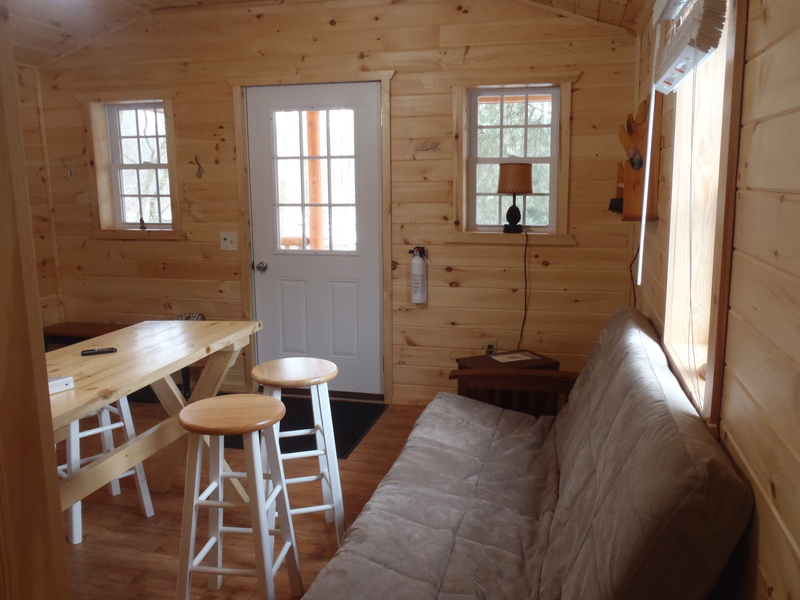 This blog shows an updated photo tour of our Chipmunk Cabin at Fish Creek Cabin Resort. When you enter this cabin you walk into the lodge area and kitchen. Get comfortable by cuddling up on the couch in this room with a soft blanket and relax to the soothing sound of the East Branch of Fish Creek. Chipmunk lodge will also keep you warm by being heated! This futon unfolds into a bed for more sleeping room. The photo below shows the middle room from the bedroom doorway. Here is a picture of the bedroom in Chipmunk. There is a full matress and two twin mattresses. Be sure to remember to bring you own pillows, linens, and blankets! 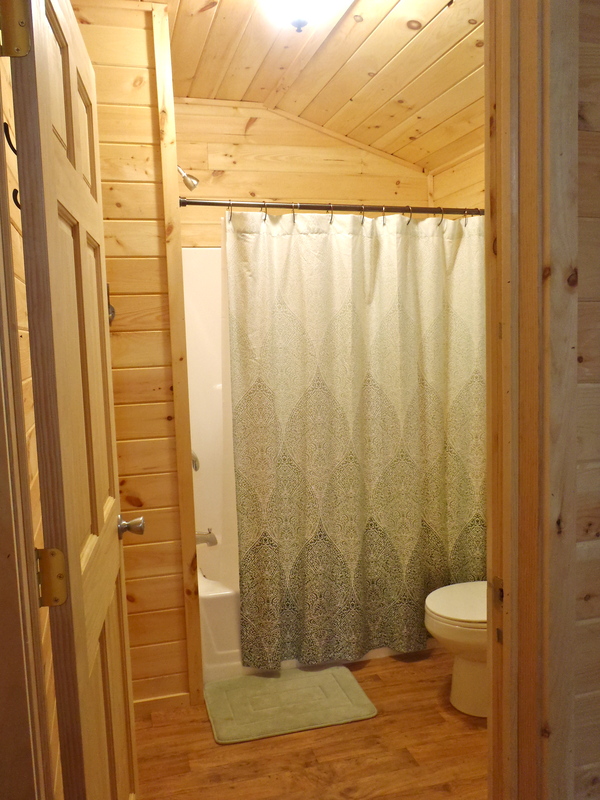 Below is a photo of the bathroom in Chipmunk, which has a full tub/ shower, toilet, sink, and mirror vanity. The cabinets in the kitchen of Chipmunk are stocked with cooking utensils, pans, pots, and dining set for up to four people (plates, bowls, cups, etc.). 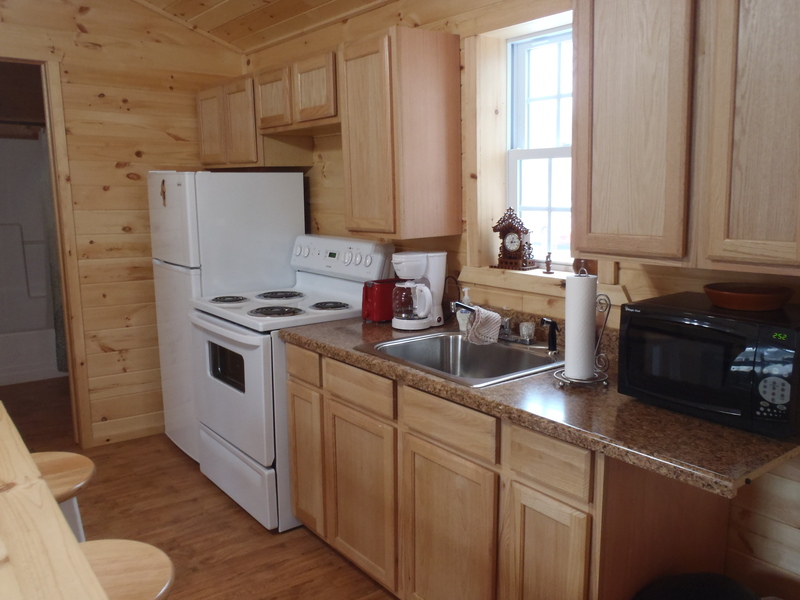 Appliances include: four burner range, refrigerator, coffee maker, microwave, and toaster. 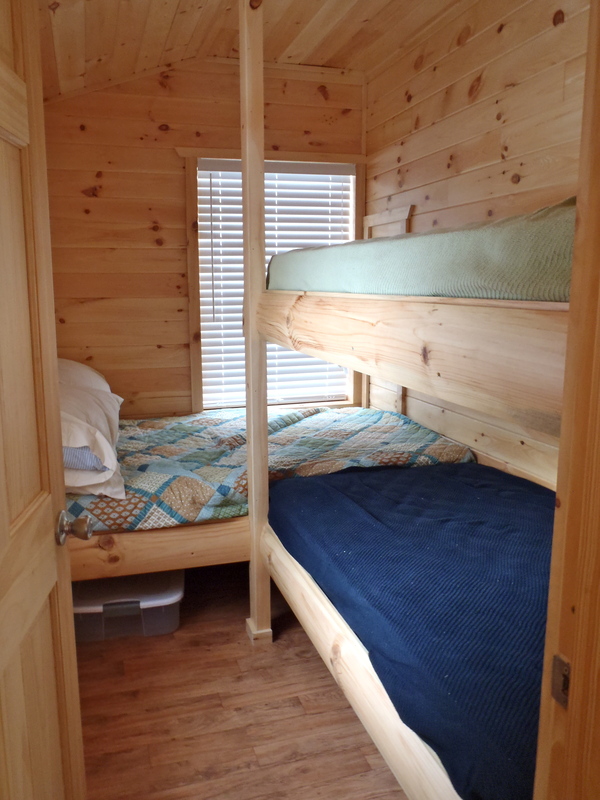 Fish Creek Cabin Resort provides everything needed to lodge comfortably in a home away from home, our Chipmunk Cabin. You can also enjoy sitting by a warm fire, we have firewood available! There is also a charcoal grill outside the Chipmunk Cabin for your use. 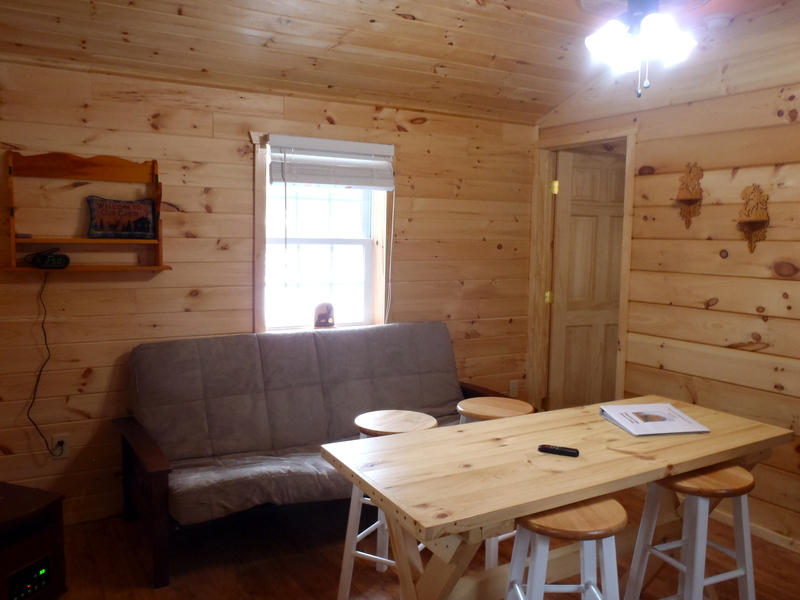 Book your winter getaway lodging in our Chipmunk Cabin for $125 a night Monday- Thursday and $150 a night Friday-Sunday. Have more questions or ready to book? 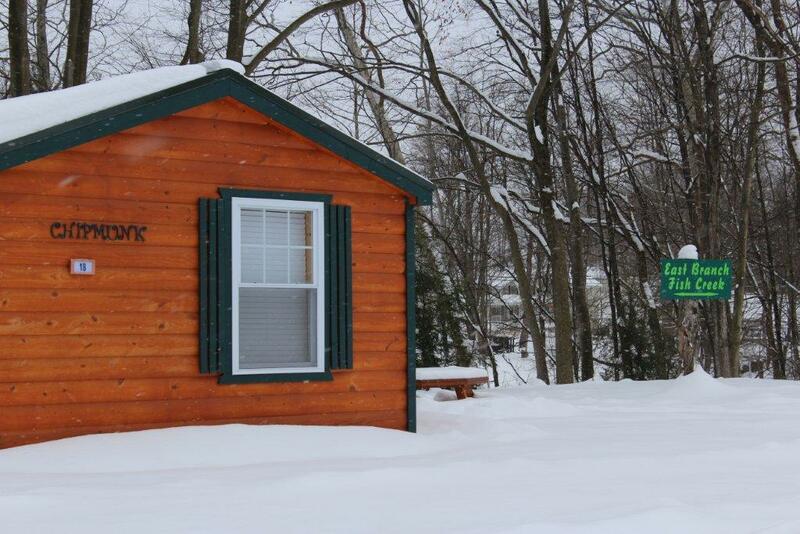 Give us a shout by email (info@fishcreekcabinresort.com) or call us at (315) 749-8912.